How can you design an outdoor kitchen? 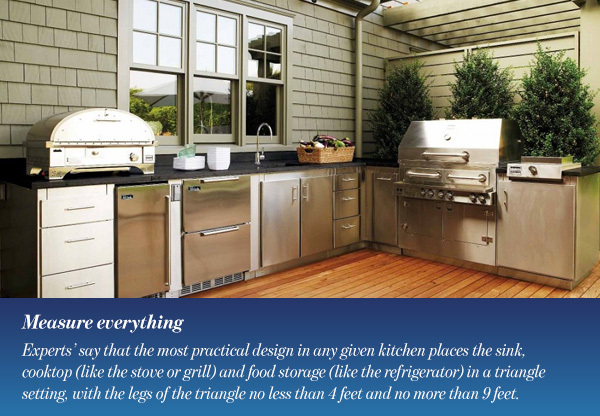 Or first, what is an outdoor kitchen? An outdoor kitchen can simply mean a grill, table and some chairs. Or it can mean a fully equipped kitchen complete with fancy seating. The size and style is completely up to the available space, and also your family’s needs. A good outdoor kitchen should be functional, welcoming and entertaining. It should be a place where the family can hang out together to cook and eat. 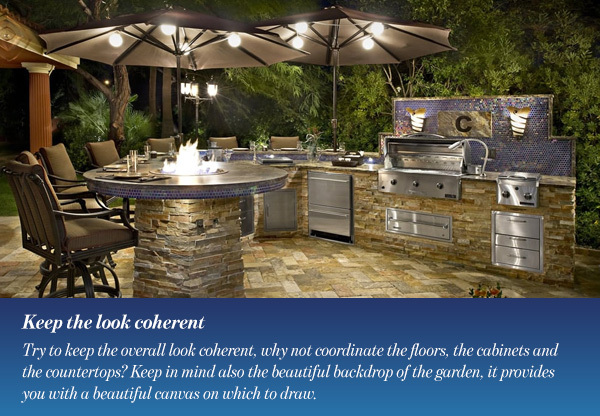 We have gathered here some of the best expert tips to help you design an outdoor kitchen. Proper flooring will add durability and value to your kitchen, as well as complete the design. Thus, the floor is the first element you should consider. 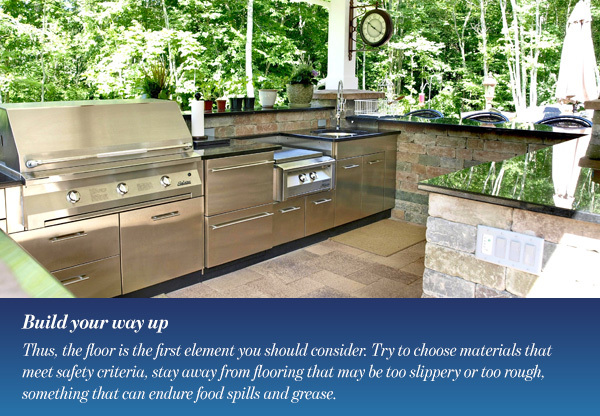 Try to choose materials that meet safety criteria, stay away from flooring that may be too slippery or too rough, something that can endure food spills and grease. Also consider the different weather changes year round in your area, as well as the weight of the appliances you will be installing. Stone for example is an excellent choice, it is very durable and it adds a beautiful rustic look. 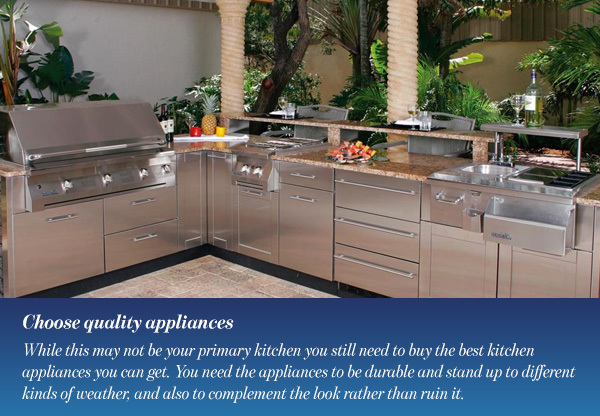 Deciding the size of your outdoor kitchen depends on several factors. First, the size of the whole backyard, you do not want the kitchen to take up the whole space. Second, the size of the appliances you want in the kitchen, and how many of them will you need? You need to leave space for the appliances, as well as sufficient space between them. Experts’ say that the most practical design in any given kitchen places the sink, cooktop (like the stove or grill) and food storage (like the refrigerator) in a triangle setting, with the legs of the triangle no less than 4 feet and no more than 9 feet. Just as an indoor kitchen, having diverse work surfaces and various counter heights can allow for different functions within the outdoor kitchen. Just make sure the diversity flows naturally in the design. 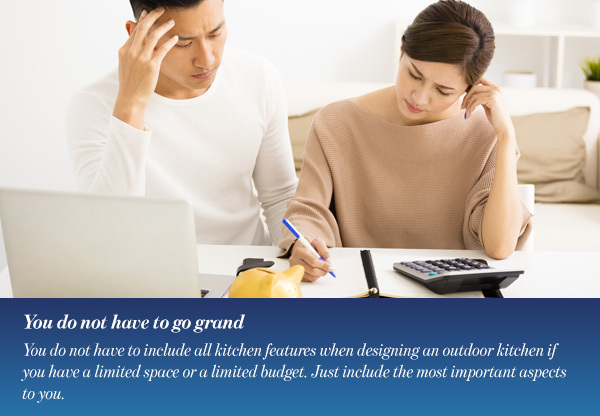 Just because a kitchen is in the open air, it does not mean that you can overlook storage! Storage is an integral part of any kitchen; it prevents clutter and also allows you to find everything you need within reach. 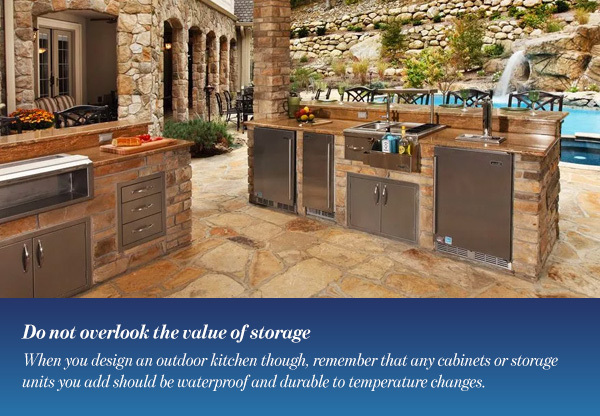 When you design an outdoor kitchen though, remember that any cabinets or storage units you add should be waterproof and durable to temperature changes. Do not go overboard though and keep in mind how much storage you will actually need and really use for your kitchen. Do you plan on using this kitchen only in one season when the weather permits or year round? Do you plan on hosting a lot of guests outdoors or is it just for family? Carefully planning how you will use the space will help immensely with designing the space. Try to keep the overall look coherent, why not coordinate the floors, the cabinets and the countertops? Keep in mind also the beautiful backdrop of the garden, it provides you with a beautiful canvas on which to draw. So do not waste this canvas with a mismatched look. Think of the outdoor kitchen as a place to cook, eat, relax and entertain. This is a great opportunity to enjoy the outdoor weather while gathering around a nice meal. So, incorporate features that will help you make the best out of the kitchen. Choose the furniture carefully, maybe a large table that you can use to entertain or as a buffet if you have many guests, and chairs that stack so you can store the extra ones when not in use. If maintaining the view you have from inside the house to the outside is important to you, then place the outdoor kitchen to the side or at an angle that does not obstruct the view. While this may not be your primary kitchen you still need to buy the best kitchen appliances you can get. You need the appliances to be durable and stand up to different kinds of weather, and also to complement the look rather than ruin it. For example stainless steel appliances would most probably stand all weather conditions, are extremely durable, and also require very low maintenance. You do not have to include all kitchen features when designing an outdoor kitchen if you have a limited space or a limited budget. Just include the most important aspects to you. Consider what do you really need to include in your outdoor kitchen. If you have limited space, just stick with the basics. Less can be more. Maybe just build a BBQ island, which offers a grill and countertops, you can even fit some high stools around the countertop for eating. 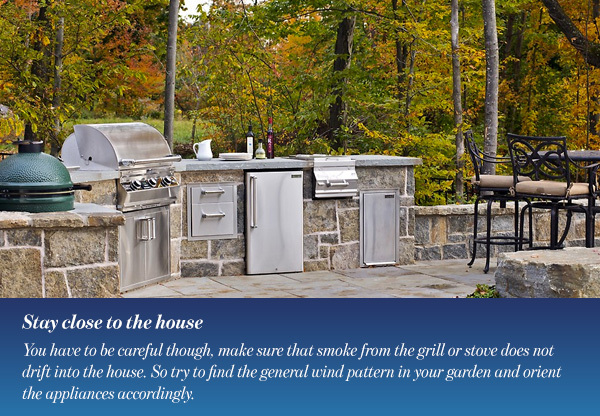 Keep your outdoor kitchen close to the house, even if you have a spacious backyard. First, if you stay close to the house you will not have to carry heavy trays of food and supplies for a long distance. The best location would be between 15 and 20 feet from the indoor kitchen. Second, it will cost less money to run utilities a shorter distance from the house. It will also be less of a hassle. Moreover, you can extend an overhang from the house to create a nice large shade. You have to be careful though, make sure that smoke from the grill or stove does not drift into the house. So try to find the general wind pattern in your garden and orient the appliances accordingly.